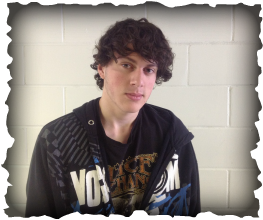 Dennis Metzger has been selected as the Student of the Month for May. He has been attending Gateway since March and is a freshman. Dennis has already completed three classes and has been an active member in community service opportunities. His assistance with Gateway’s first graduation was greatly appreciated. Dennis is kind and polite and has been a welcome addition to the school community. When not in the classroom, Dennis enjoys almost anything outdoors. 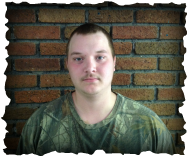 He looks forward to spending time at Thornapple Lake this summer with his family, where he hopes to be camping, boating, and fishing. Congratulations Dennis, keep up the good work! Curtis Elliott has been selected as the Student of the Month for April. He has been attending Gateway since the beginning of the school year and is a junior. Curtis has performed well in classes and has been an active member in community service opportunities. His favorite activities have included The Wall That Heals and volunteering at Leila Arboretum in Battle Creek. Most recently, Curtis applied for and was awarded a student curiosity grant from the Gull Lake Community Schools Foundation! The grant will be used to start the Salmon in the Classroom partnership with DNR this fall. When not in the classroom, Curtis enjoys almost anything outdoors. He is an avid deer and turkey hunter, as well as a fisherman. Curtis is interested in joining the military in the future or pursuing a career that includes his interests in the out-of-doors. Congratulations Curtis, keep up the good work! 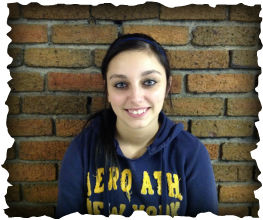 Vanessa’s future plans include going to a local community college and study to become a nurse. She says that this has been a dream of hers since she was a little girl. Her family continues to motivate her to do the best work she can, they say that she can do anything she puts her mind to! Congratulations Vanessa, keep up the good work! Rene Mingus has been selected as the Student of the Month for February. She is a first year student that is planning on graduating this May. Rene enjoys taking online classes and the ability to work at her own pace. She says that the different school environment at Gateway has really helped her get close to her graduation goal. In her free time, Rene enjoys writing and playing video games. She likes to write modern fiction with supernatural themes. She is looking forward to going to college in the fall and to continue working on becoming a public author. Congratulations Rene, keep up the good work! Austin Scott has been selected as the Student of the Month for December. He began attending Gateway after Christmas break and immediately began working on recovering credits. Austin has a goal to complete his coursework during the next school year. Away from school, he enjoys listening to music and watching movies. This is also one of his favorite things at Gateway, “Movie Friday” at the end of each month. Congratulations Austin, keep up the good work! Megan Whipple is a first year student and is currently a junior. She was selected because of her consistent attendance and positive attitude. Megan has completed more than four courses and is a great pace for graduation. What she likes most about Gateway is the smaller amount of students and being able to work at her own pace. At home, Megan takes care of her dogs and enjoys listening to country music. Kaylee Underwood has been selected as the Student of the Month for November. She is a second year student and is currently a sophomore. While at Gateway, it is normal to complete one course at a time, Kaylee began the year working on three classes simultaneously and completed them within days of each other this month. She has also earned two 1/2 days passes for excellent attendance. Kaylee likes the freedom to work at her own pace and graduation is her motivation to work hard everyday. When not at school, she takes care of her animals at home and enjoys riding her horse, where she can spend some time alone! The staff at Gateway appreciate her great attitude and the example she sets for all students. Congratulations Kaylee, keep up the good work! 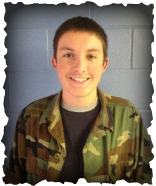 Erik Sullivan has been selected as the Student of the Month for October. He is a first year student at Gateway and is currently a senior. Erik has completed his coursework in Economics and now has 5 classes remaining until graduation. Keep up the good work, congratulations Erik! Drew Losey has been selected as the Student of the Month for September. He is a first year student at Gateway and is currently a sophomore. Drew completed his first course, US History, during the first 15 days of school! He enjoys the freedom to work at his own pace at Gateway Academy and his motivation graduate is the chance to serve his country with the United States Army Airborne. During his spare time, Drew enjoys participating in World War II reenactments at Fort Custer and all over Michigan. Keep up the good work, congratulations Drew!